If you enjoy Batman coloring pages then this game is perfect for you. Color your favorite superhero by choosing the right colors and print out your artwork. You can even print out this Batman coloring page and then use your colored pencils to paint it offline. 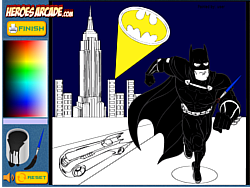 Have fun playing this Batman coloring game!